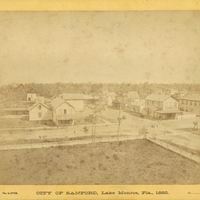 First Street between Palmetto Avenue and Magnolia Avenue in Sanford, Florida, in 1882. On the southeast corner of Palmetto and First is the town drug store, which also housed the post office. The two-story building to the south of the drug store is Hester & Sheppard's saloon. West of the drug store is the George A. Sawyer building. P. J. Parramore's livery stable can also been seen in the distance of the left-hand side of the photograph. An artesian well of sulphur water is photographed in the center of the Palmetto-First intersection. The backyard of the Sanford House Hotel is on the northwest corner of the intersection. Henry L. DeForest's general store is located northward across First Street. On First Street, west of DeForest's store, is Darady's saloon. The Stafford & Ellis hardware store and tinshop was located in the tall building across First Street. Rudoplh Muller's boardinghouse and barber shop is the wide house behind the large oak tree, with Louis Hoefer's bakery to the west. Original 11 inch x 8.5 inch photograph by Upton, 1882: Sanford Museum, Sanford, Florida. Digital reproduction of original 11 inch x 8.5 inch photograph by Upton, 1882. "FORTY-FOUR YEARS AGO IN SANFORD: 'CITY OF SANFORD, Lake Monroe, Fla. 1882.'" Sanford Today Vol. 1, no. 8. September 4, 1926, page 2. Upton. 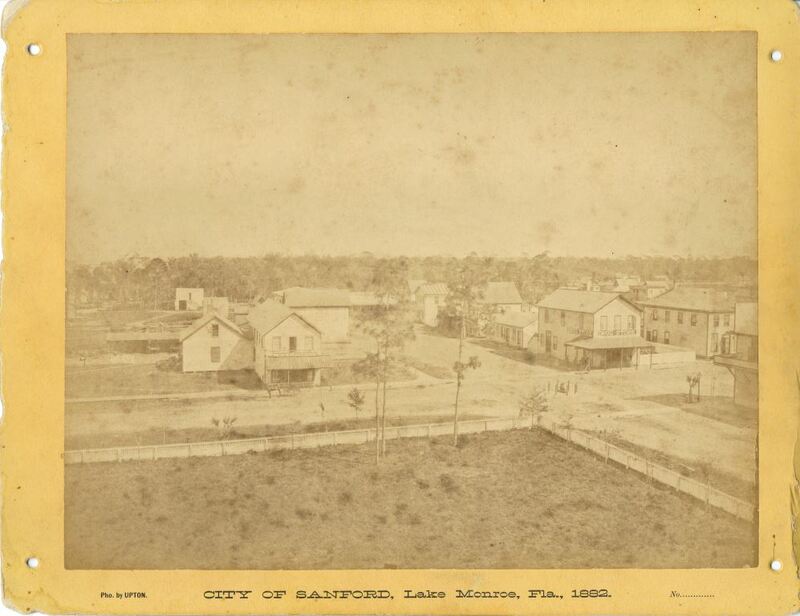 “Palmetto Avenue and First Street in Sanford, 1882.” RICHES of Central Florida accessed April 19, 2019, https://richesmi.cah.ucf.edu/omeka/items/show/4295.